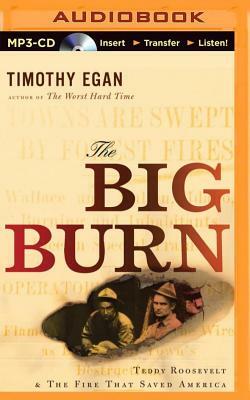 In The Worst Hard Time, Timothy Egan put the environmental disaster of the Dust Bowl at the center of a rich history, told through characters he brought to indelible life. Now he performs the same alchemy with The Big Burn, the largest-ever forest fire in America, a tragedy that cemented Teddy Roosevelt's legacy. On the afternoon of August 20, 1910, a battering ram of wind moved through the drought-stricken national forests of Washington, Idaho, and Montana, whipping hundreds of small blazes into a roaring inferno that destroyed towns and timber in an eye-blink. Forest rangers assembled nearly 10,000 men - college boys, day workers, immigrants from mining camps - to fight the fire. But no living person had seen anything like those flames, and neither the rangers nor anyone else knew how to subdue them. Egan narrates the struggles of the overmatched rangers with unstoppable dramatic force. Equally dramatic is the larger story he tells of President Teddy Roosevelt and his chief forester, Gifford Pinchot. Pioneering the notion of conservation, Roosevelt and Pinchot did nothing less than create the idea of national forests as our national treasure, owned by and preserved for every citizen. The robber barons fought them, but the fire saved the forests even as it destroyed them: the heroism shown by the rangers turned public opinion permanently in favor of the forests, even as it changed the mission of the Forest Service, with consequences felt in the fires of today.